Before I venture much further down the road of producing content for CHSR in the form of “Music Reviews” I feel that there is an elephant in the room that needs to be addressed. It has been brought to my attention (but not to my surprise) that my writings are skewed towards the positive in a big way. And I’m not going to deny it for a second, but I am going to take a moment to explain myself. Less than half a decade ago I was bemoaning the fact, like many others do, that there was no good new music out there. The actual fact is, I’m not sure there’s ever been more good music out there now that technology has removed the barriers to producing decent quality recordings of one’s songs at an accessible price. The issue is that good new music doesn’t find you as easily anymore. Mainstream media is in the superstar business, not the music business. You have to go searching on your own to find the good stuff, which can be an overwhelming charge. I’m always grateful for help in this regard, and in return, I hope to help others on the same journey. I’m fortunate in that I have solid local indie radio to listen to, and I have some great friends with incredibly high music IQs that provide me with endless playlists of undiscovered awesomeness. So when I encounter some music that I don’t like (or, more accurately, don’t get…) I simply move on. I invest my time in music that I think is worth your time. If requested to review some piece of music or art in particular, I’ll be open and honest, but if given the mandate to select my own subject matter, I will lean towards projects that resonate with me. With that out of the way, I want to discuss an album that really resonated with me in a big way. 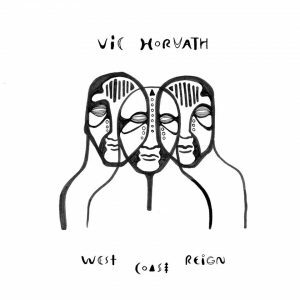 “West Coast Reign” by Vic Horvath was among a handful of albums that I snagged from the CHSR new-music shelf to summarize and ensure it’s fit for their very accepting airwaves. Well, it’s fit for the airwaves. The album is 7-track beauty that is raw, authentic, and roots to the bone. The production makes you feel like you are in the room while the magic takes place. The occasional chair creaks, the door opens and closes, and the cookie cutter is left in the drawer where it belongs. The opening track, Shiny Shotguns, is an eclectic lullaby. Pistol and Rye is a toe-tapping roots jam. Black Magic Tradition is a prog-folk piece that shifts time signatures between movements while staying close to the core of Horvath’s Canadian-Americana lyrical sensibilities. Kiss Nice turns the page and delivers an acoustic blues-rocker that evoked my very best “This is a seriously good tune” facial expression. Ratts and Races provides an introduction to the haunting beauty that Horvath is capable of channeling. The simple instrumentation and vocal harmonies gave me chills. This wasn’t recorded to a click track and over-edited. They just let the magic happen in its own time. The penultimate track, Sow it in Spells is a cheery folk-blues tune that cleanses the palette before the finale, Don’t Go Lightly. I think that at the end of 2017 I will compile a list of the best new songs that I discovered this year. “Don’t Go Lightly” will be firmly on that list. It’s the embodiment of a song written using nothing but 3 chords and the truth that leaves the listener infatuated. This is, in my opinion, the best song in a collection of great tunes. Now that I’ve been so fortunate to discover Vic Horvath as an artist, I cannot wait for the opportunity to see them play live.